Groovy Sixties Video Slot Guide & Review - Casino Answers! The Groovy Sixties is a 5-reel, 4-row, 40-line video slot developed by Net Entertainment, featuring stacked wild symbols, scatter wins, multipliers and a free spins feature. You can play the Groovy Sixties video slot at Bovada. As you can expect from a video slot set in the 60’s, the Groovy Sixties video slot is very bright and colourful, giving it a very psychedelic feel. It has music and sound effects that suit its theme very well. Symbols on the Groovy Sixties slot game are the 60’s wild symbol, 60’s Girl scatter symbol, VW Bug, Classic Television Set, Tape Recorder, Movie Camera, Go-Go Boots, Lava Lamps and Ace, King, Queen and Jack symbols. For a look at the Groovy Sixties video slot from Net Ent, a screenshot is below. Coin values on the Groovy Sixties slot machine are $0.01, $0.02, $0.05, $0.10, $0.20 and $0.50. You can play 1-40 paylines at 1-5 coins (or bet levels). You can bet as little as a penny on a spin on The Groovy Sixties up to the maximum total bet of $100. You can manually skill stop the reels during a spin by hitting the Spin button in mid-spin. To play the Groovy Sixties slot game at the highest bet level with all 40 lines selected, hit the “Bet Max” button. For all other bets, select your bet and hit the “Spin” button. The 60’s Wild symbol is the highest paying symbol on the Groovy Sixties online slot game. 5 60’s Wild symbols on a selected payline will pay out the 1000 coin top jackpot. The 60’s Wild symbol is a stacked wild symbol, which not only means that it will substitute for all other symbols in the game (except for scatters), but also multiple wild symbols can show up on each reel to create many more possible winning combinations. The stacked wilds feature can help you win lots of moolah when you play The Groovy Sixties at Bovada! The 60’s Girl is scattered on the Groovy Sixties video slot. 3 of these 60’s Girl symbols will not only pay 2X your total bet, but also will win you 5 free spins with a 2X multiplier. During the free spins feature, 3 more Scattered 60’s Girl symbols will still pay 2X your total bet and re-trigger the free spins feature. Winning combinations and payouts are made according to the Paytable. Payline wins are multiplied by the bet per payline. Wild symbol substitutes for all symbols except scatter symbols. Multiple wild symbols on each reel line up to create stacked wilds. Scatter wins are paid independent of bet lines selected. Only the highest win per active payline will be paid out. Payline wins pay if in succession from leftmost to right. Simultaneous wins on different paylines are added. For the majority of the payout schedule, a screenshot of the Groovy Sixties Paytable is below. The Groovy Sixties has an autoplay mode that can be opened up by hitting the “Auto” button. You can play 10, 25, 50, 75, 100, 250, 500, 750 or 1000 autoplay spins at a time. 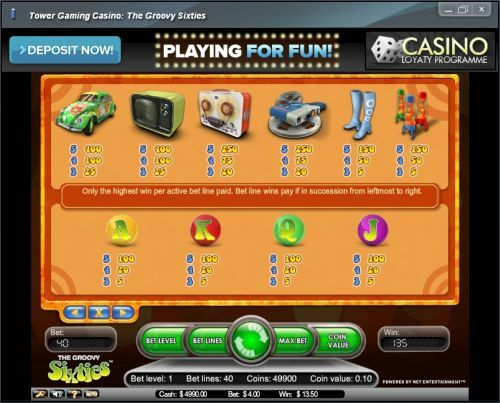 In the advanced settings, you can set the Groovy Sixties autoplay mode to stop on any win, if free spins is triggered, if the jackpot is won, if a single win exceeds (any amount you input) and if cash increases/decreases by (any amount you input). You can stop the autoplay mode at anytime on the Groovy Sixties video slot. The Groovy Sixties video slot is an excellent representation of a decade that promoted peace, love and rock and roll. 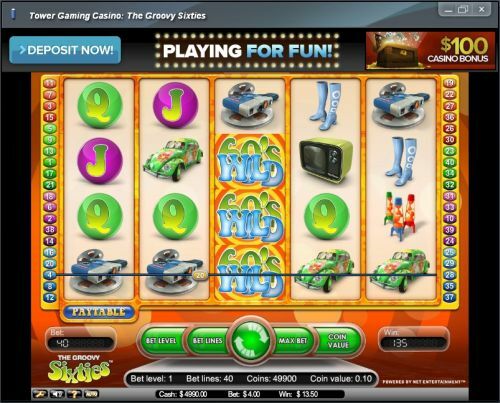 Not only does the video slot have a very amusing theme, but it also gives you the chance to win cash from its free spins feature and stacked wilds. You can play the Groovy Sixties video slot when you sign up and make a deposit at Bovada! Where can I play a Groovy 60’s Flash game for free? You can play a Flash game of the Groovy 60’s online slot game for free or for real money at Bovada. If you experience problems with the Instant Play casino software, try downloading and installing the latest version of Adobe Flash Player. Can USA-based players play the Groovy 60’s online slot for real money? No, players from the United States of America cannot play The Groovy Sixties for real money. For another 60’s-themed slot game that American players can play, please read our Psychedelic Sixties iSlot Review or play it at the USA-friendly DaVinci’s Gold Casino. If I have a Mac, can I play the Groovy Sixties slot game? Macintosh users can either use the Flash casino at Tower Gaming Flash Casino and Casino Euro or there is a Macintosh casino they can download at Tower Gaming Casino. For more on Tower Casino, please read our Tower Gaming Review. Where can I play the Groovy 60s slot game? You can play Groovy 60’s at either Tower Gaming Casino and Betsson Casino. For more information on these casinos, please read our Tower Gaming Casino Review and Betsson Casino Review.